Guarantee your hotel & casino guests a perfect cigar every time! Simplify your cigar sales with CertiFresh custom-packaged, perfectly-humidified cigars. No more humidor maintenance, no more stale cigars, no more damaged cigars due to over-handling. Your custom artwork and our premium brand-name cigars are a perfect fit for the casino gift shop, game table service, poolside, bar or fine dining restaurant. 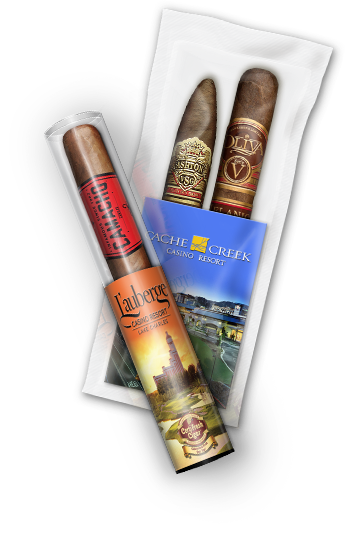 CertiFresh is the only cigar purveyor that promotes your casino, show, or restaurant with every cigar sold -- because each cigar you sell is custom-branded to your operation! Artwork can be customized for any VIP guest to feature their company or event -- at no additional charge. Contact us for a free digital proof of your property's artwork today! © 2014-2018 CertiFresh Cigar. All rights reserved. Site Design, Development & Hosting by Olive Street Digital, Inc. This website is for informational purposes. We do not sell any tobacco products directly to consumers. This website is not intended to be viewed by anyone under the legal minimum purchase age in your state. If you are not of legal age please do not enter this website.